When your vehicle generates those emission codes it simply means that the converter is not able to function properly. Remember that the catalytic converter is at the very end of the emission diagnostic system, and a number of things can go wrong upstream of the converter that can cause. a PO420 (or PO430) MIL light illumination. Following is a list of procedures that should be accomplished before the final determination that a new catalytic converter is needed. These are known as diagnostic procedures and go far beyond someone just performing a simple code reading and then declaring a bad converter is present. That is not performing proper diagnostics! The following items will outline proper diagnostics in determining whether a converter is good or bad. There are 711 possible PO generic DTC error codes. Only 7 of the 711 codes are exhaust related. Have there been any driveability or performance issues with the vehicle, have there been any recent repairs or tune-up work performed, if so was the check engine light reset and were the codes recorded on previous repair orders. Do not rely on scan tool data alone. In most applications, the customer will have the check engine light reset prior to repair. If the original cause of converter failure is intermittent, only the catalyst failure code may show up (masking the original reason for converter failure). If possible, test-drive the vehicle and note any driveability issues that may indicate fuel or spark delivery problems such as hesitation, stumbling, spark knock or signs of misfire. Idle smoothness. Check for any signs of surging or roughness, indicating misfire or improper fuel delivery. Check the tailpipe, particularly immediately following start-up, for any smoke indicating too rich AFR (black smoke), water/antifreeze (white Smoke), or oil (blue smoke). Listen to engine carefully for any signs of vacuum or exhaust manifold leaks. Inspect intake system for signs of oil indicating excessive blow-by or cracks that may cause leaks. Inspect spark plugs/wires and air filter. Do not reset MIL light!! Read the OBD-II readiness tests to ensure all tests have been completed. If the tests have not been completed, chances are the MIL was recently reset, possibly hiding intermittent problems. Read trouble codes (if any) and inspect as necessary. Read pending trouble codes (if any) and inspect as necessary. With engine running and at operating temperature, read scan data list. This is typically a table listing all available sensors and outputs. Look at Long Term Fuel Trims (LTFT). These show the amount (in %) the computer is modifying fuel delivery, based on the 02 sensor feedback. Positive numbers indicate the computer is adding fuel, negative numbers indicate the com­puter is removing fuel. Large positive numbers (>10%) should be investigated further as they indicate the computer is adding more fuel than originally designed. Sensor 2 should show a fairly steady signal. It is not critical what the signal is, only that it does not oscillate as frequently as the front. If the signal is above 250mV, the sensor is fine. If it is below, check for activity by rapid accelerator kick-down or by raising the engine speed to approximately 2000 rpm. Any movement indicates the sensor is fine. The most important thing to remember about Oxygen Sensors is that they were never meant to last the life of the car! They are wear items and need to be replaced as you would brakes, tires or spark plugs. When Oxygen Sensors reach 80,000 miles plus...change them. Catalytic Converters do not go bad by themselves, 95% of the time some other issue with the vehicle will destroy the cat and most of the time it is the Oxygen Sensors. Even when you have them checked and the tech says they are operating okay...if the mileage is over 80,000 change them. When sensors reach that age they may still be functioning but the signal they send becomes lazy and since they operate in millivolts the slightest signal fluctuation can cause an air/fuel mixture problem and that in turn will take out the cat. If you are in the market for a converter and the vehicle still has the original Oxygen Sensors you should strongly consider their replacement...if not you could be buying another converter 90 days down the road. The material above is designed to give our customers a better insight to their need of a catalytic converter replacement. If someone has told you that a new converter is required on your vehicle just from the simple reading of a "check engine light" code they are not doing their due dilligence and not performing complete diagnostics on that vehicle. Cars today are not smart enough to tell us what is wrong with them just by generating code, they simply tell us what hurts and it is up to a technician or mechanic to interpret those codes and then get to the root of the problem. The last thing you do when you get a "Below Efficiency or Under Threshold"
code is to immediately change the Catalytic Converter !!! unable to keep up performance. If any of these conditions are present you most likely will have a cold non-functioning converter emitting too much NOX or O2. Correct all other engine trouble codes. De-Carbonize all engines over 80,000 miles. Inspect for head and intake gasket leaks. Check EGR system and clean ports of excess carbon build up. Inspect and test fuel pressure. Check for leaking injectors. Check for heavy oil usage. Monitor fuel trim for signs of excessive correction by the PCM. DO NOT USE silicone sealers. Reset all monitors and Drive Cycle test. Fill out the warranty card. When a vehicle is exhibiting one of these codes (or variations of these, such as P0421/P0431) you can prevent a lot of headaches if you'll follow these simple steps. First, if ANY other OBDII codes are present, address them first. 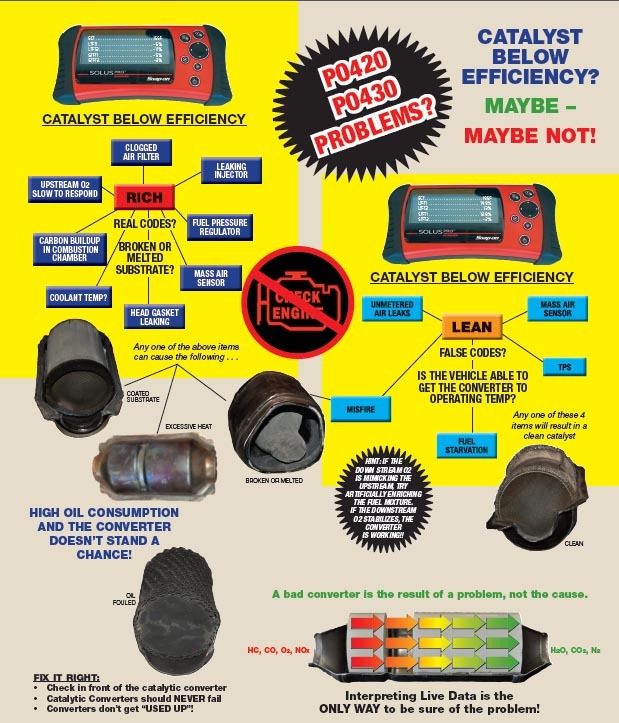 Evaporative codes, Lean/Rich codes, Timing Control codes, etc... can all cause false catalyst codes when there is actually nothing wrong with the converter itself, so if any code other than the P0420/P0430 family of codes is present, start there! That being said, before condemning any catalytic converter, whether the original converter on a vehicle with 250,000 miles, or one that has been replaced, a few simple steps with your scanner will help eliminate costly comebacks. First, just to level the playing field, for the purposes of this test, hook your scanner up in OBD II GLOBAL MODE rather than the vehicle specific mode where you would input the VIN. This will ensure we are working with the same information scales. Be certain the vehicle is running at operating temperature, and the computer is in closed loop. Since we are hooked up in OBD II GLOBAL, the fuel trim data will be represented as a positive or negative number with ZERO being the center point. A fuel trim of 0% is perfect, but unrealistic, some amount of trim should always be expected, and even required for proper vehicle operation. The OBD II parameters for fuel trimming are generally 25% positive or negative before setting P0171, P0172, P0174 or P0175 codes, but catalyst codes will be set long before the trim reaches those numbers. For our purposes, we will use the rule of 10%. When adding the long term trim to the short term trim, we are obtaining a very basic "total trim number". This number should be close to zero, never exceeding 10% positive or negative, and ideally within 5%. For example, a LTFT of 3% and a STFT of 1% would give a total trim of 4% which is well within the normal range. Negative numbers can work in our favor as well, say the STFT is 4% and the LTFT is -2% the total trim number would be 2% which is near perfect. The same thing if the total trim number wound up in the negative, a number close to zero is fine, but 10% negative is out of limits for our purposes. Now, there is another "rule of 10%" which can be an evil time waster. Besides the total trim value being well below the magic 10%, the spread between the long term and short term fuel trim values must be as well. As we said above, adding a negative number to a positive number can get you closer to zero which is a good thing, but if the spread is too large, we need to find out why. For example, LTFT is 7% and STFT is -7%, well that would give a total trim number of zero which is perfect, right? Not really. The spread between the numbers is a whopping 14% which vastly exceeds the "rule". Yes it's true the total trim number is zero, but it's a bad way of getting there. It is an indication that the PCM is not in complete control of the fuel injection, it's scrambling to make up for an issue that is nearly out of its control. If the vehicle utilizes MAF, this condition STRONGLY suggests Mass Air Sensor issues. If the vehicle utilizes MAP, check the vacuum at the MAP sensor, etc. Of course there are other causes for this type of reading, but start with these common ones. OK, let's say the numbers are all well within our 10% limits at idle (remember, that doesn't mean 9% is good, you just haven't observed the numbers exceeding 10% yet). Let's be certain there is not a fuel starvation issue here. Now hold the engine RPMs up around 2500 for a minute and observe the trim data once more. Hint: if the numbers don't change, that would be very suspect. Short term trim will usually be moving all the time, but if your Long term trim doesn't change between idle and 2500, it's time to start looking further. (This does not hold true for VW and Audi, their Long Term Fuel Trims generally will not change unless the vehicle is moving at a cruising speed). Now check your results. If the numbers are well within 10%, replace the converter along with the upstream oxygen sensor(s) and you should not encounter further problems. Remember, oxygen sensors have a useful life of approximately 80,000 miles. Even if you went to the trouble of connecting a digital scope to the signal wire and observed the sensor crossing 450mv within the 200 millisecond parameter during a drive, what happens next week when the sensor exhibits a slowness to switch due to age and deterioration allowing the vehicle to run rich for too long a period, destroying the new converter? Who did you just do a favor for? ALWAYS replace the upstream oxygen sensor when replacing a converter unless you are certain the sensor has only a few miles on it.